Did you enjoy a cup of coffee this morning? You can thank the bees! Of the 1,400 crop plants grown, nearly 75% depend on pollination, including coffee, almonds, many fruits, and chocolate. Without bees and other pollinators, our diets would be severely limited, and it would be more difficult to acquire the variety of vitamins and minerals that we need to stay healthy. 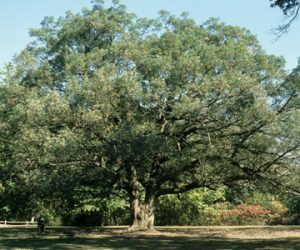 Plants also support a wide variety of natural ecosystems that sustain life for many creatures, and those plants are supported by pollinators. 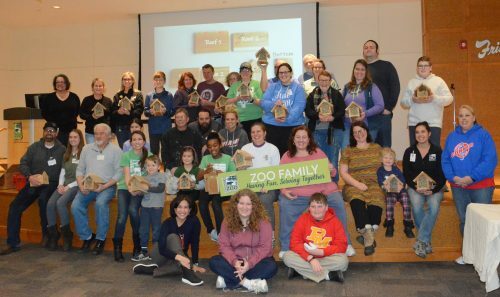 Recently, the Cincinnati Zoo’s Family Community Service Program spent an afternoon building houses for mason bees. One of Ohio’s 500 native bee species, the mason bee is a solitary and stingless super pollinator. 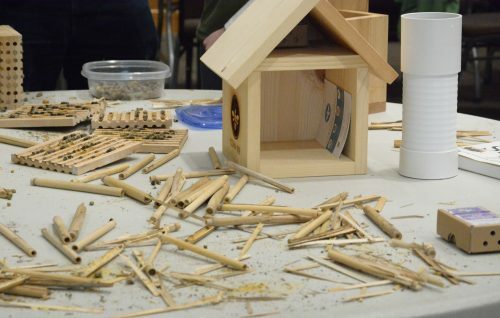 Volunteers constructed houses that offer mason bees a safe place to lay eggs and raise young bees. 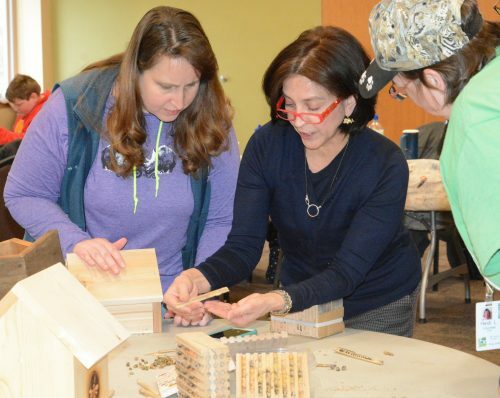 With education and guidance from Justina Block of Osmia Bee Company, our group learned about caring for mason bees and assembled 26 houses for them! 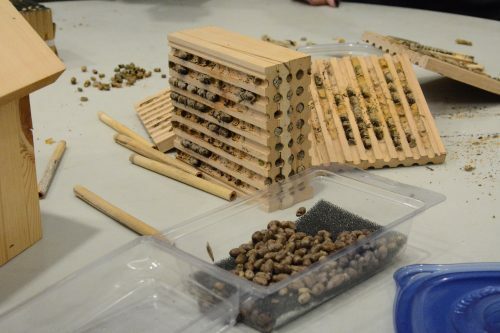 Mason bees are called mason bees because in a sense, they do masonry work. They use mud to build cocoons for baby bees. 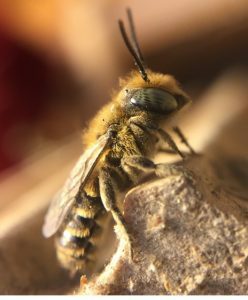 They are solitary, unlike the social honey bee that relies on a complicated relationship within the colony; mason bees work alone. And, they are some of the first bees to emerge in the spring. Mason bees are super pollinators, so it’s very important to provide them with early blooming flowers to visit in addition to the houses. 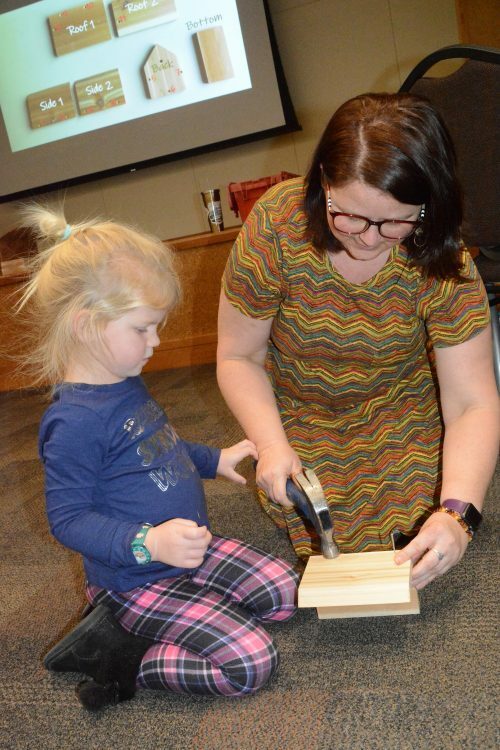 Want to see a mason bee house in action? Next time you’re at the Zoo, stop by to see the house we have up near World of the Insect. 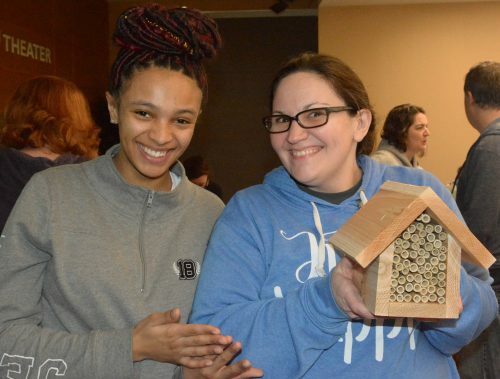 We’re building a better home for wildlife by creating shelter for these super pollinators, and we invite you to do so, too! 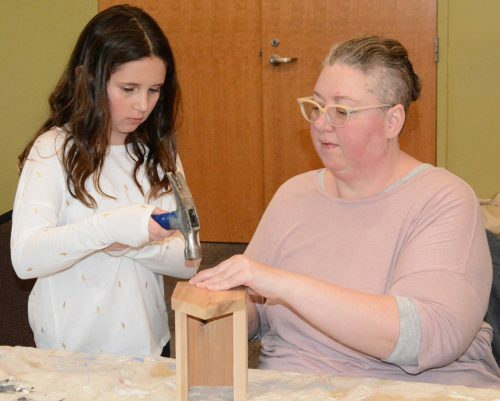 If you decide to make your own mason bee house or purchase one for your residence or business (and we hope you will! ), here are some tips for success. Grow pollinator-friendly plants in your yard to ensure plenty of sources of pollen for the bees. Early spring-blooming flowers are especially important for mason bees. Mason bees require clay mud for nesting. If your soil is not high in clay, set out a container or pile of clay mud for them to use. You may choose to paint the house, but it’s not a requirement. Mason bees are attracted to blue. bees won’t use wet nesting materials. The bees won’t mind if you hang it close to your house; they aren’t bothered by human activity. Once you’ve mounted it and bees have started nesting, however, don’t move the house so the bees can still find it. 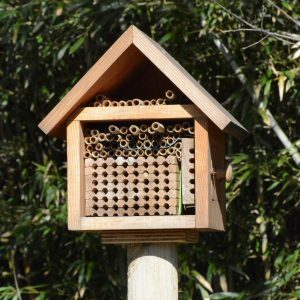 Put out your bee house in spring when you start to see things bloom, typically by the end of March. It may take several seasons before bees start using it. 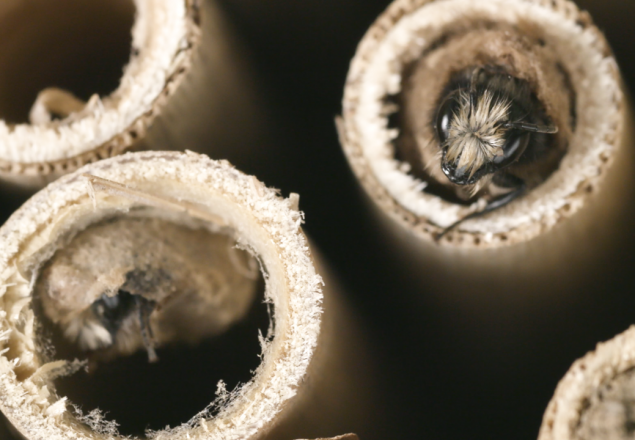 In many areas, mason bees have disappeared and will need to be reestablished. You may choose to purchase bees that you can release from Osmia Bee Company to get things started. As reeds fill up with larvae and mud, you can increase the bees’ chances of survival by removing and storing the reeds in a garage or an unheated room away from predators and parasites as the larvae develop. We recommend placing the reeds in a mesh bag for extra protection. Add fresh, empty reeds to the house as needed. Reeds will be available to purchase online from Osmia Bee Company soon. By October, the larvae will have developed into fully grown bees hibernating in cocoons inside the reeds. Cleaning the cocoons will reduce bee mortality by removing mites, etc. Gently split open the reed, remove the cocoons, and rinse them in a bowl of tap water. Place the cocoons in the refrigerator in a ventilated container with a moist paper towel until spring. Release the bees in the spring when you start to see blooms and the daytime temperatures reach 50°F. Place the cocoons in a small cardboard box with a 5/16-inch hole in one side. Place the box near your bee house as the cocoons produce a scent that encourages the bees to return and lay their eggs there. The adults should start to emerge from the cardboard box in a few days, depending on air temperature. 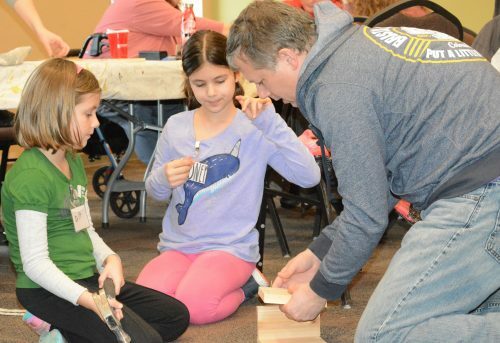 Our Family Community Service volunteers had a buzzing good time assembling mason bee houses! Interested in joining our hive? Sign up here!